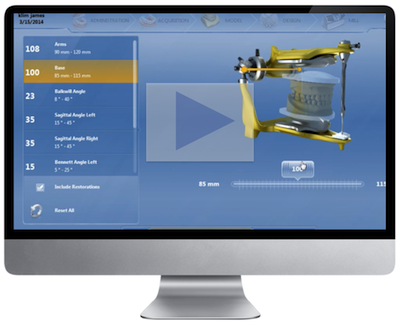 A few new features in CEREC 4.3 Articulation. When using the articulation feature, articulation must be activated in Configuration>Setting and then choose Articulation under Case Options in Administrative screen side panel. For proper articulation use, the arches must be scanned to at least the contralateral canine or full arch. Now, here is the current dilemma. I have been able to gain a predictable accurate bite registration/mounted models by scanning to the contralateral canine. However, the current buccal bite registration does not accurately mount a full-arch case predictably. The contralateral side is usually open and when scanning anteriorly for the bite registration, the distal molars are usually open. So, Sirona has some more work to do before we see a predictable full-arch mounted case be optimized for articulation features. I foresee jaw tracking for CEREC articulation as well. With the unilateral settings for protrusive, Bennett angle, and immediate side shift, we will need jaw tracking information.